Over the last couple of years I’ve been on a personal quest to simplify life as much as possible - to get rid of access junk, to find the right tools for the jobs I do and find them at quality that lasts. One of the areas I looked at this past year was my bag collection. I’ve had several but with the travel I do I didn’t have the right one. I didn’t have a carry-on that I could wear on my back that would fit all that I’d need for a several day journey. 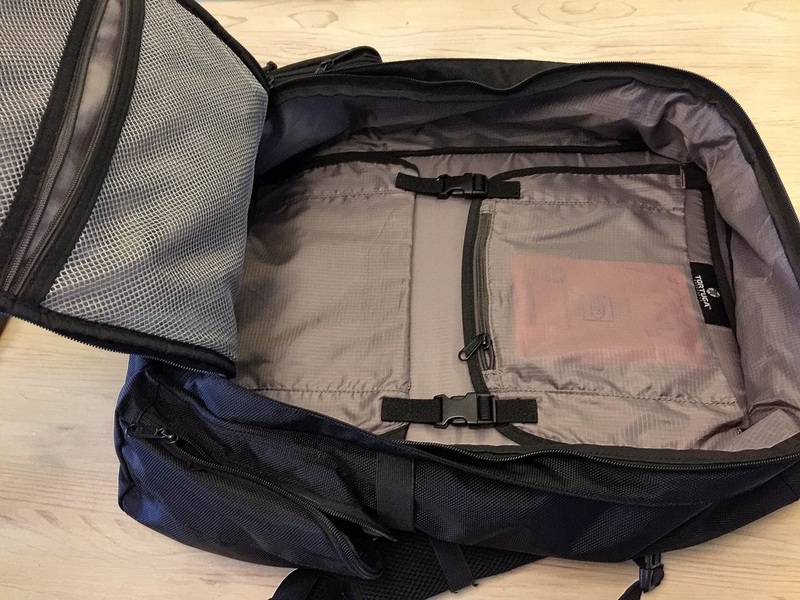 I hadn’t been quite as bothered by this until moving to East Africa; here, traveling with a single bag is an important aspect of life as its harder to manage multiples on sketchy buses and airlines frequently lose checked luggage (the last two flights I’ve been on we’ve had luggage lost; on the first, they never recovered our stroller). So finding the right carryon was important to me at the start of 2015. While recovering from surgery I did a significant amount of research, pouring over reviews and trying to balance price, material quality and the type of features I’d need out of a bag. One that I kept coming back to was the Tortuga Travel Backpack so I took the plunge and decided to go all in. I was first drawn to the notion of the company: a couple of backpackers that were frustrated with what they found as far as existing packs go as they traveled the world. That’s basically where I was after all. So these travelers sat down and asked themselves: what would make the perfect pack for us? From their Tortuga Backpacks were born, starting with the travel pack (they now have a smaller version for smaller frames and a daypack as well; I’d like to try out the latter some day but don’t know if I ever will). I was then drawn into these ideas they had for the perfect pack: no wheels, fits on the back, can carry the junk I need, easy to access, no heavy frame, hip belt for support, packs itself easily, etc. To actually dig into something of a review of the bag I wanted to start by highlighting my favorite features. This isn’t a comprehensive overview of all features rather it focuses on the features I’ve found to be really beneficial. Probably the top feature is the size: 22 x 14 x 9″ (56 x 36 x 23 cm). This means it meets carry on requirements pretty much everywhere. It’s at the upper end and if you over pack it you might find yourself riding a thin line but external compression straps help keep it in check. I’ve traveled from the US to Africa, to various spots in Africa, to Hong Kong and Taiwan and back to Kenya in the past year and haven’t had an issue with any air travel. For ground travel, being carryon sized means I can fit it on my lap and don’t have to throw it on top of a sketchy matatu or underneath a crazy dirty bus. I’ve had it filled to capacity on several of those trips and was never questioned in airport. Speaking of air travel, my favorite feature is the easy access laptop sleeve. 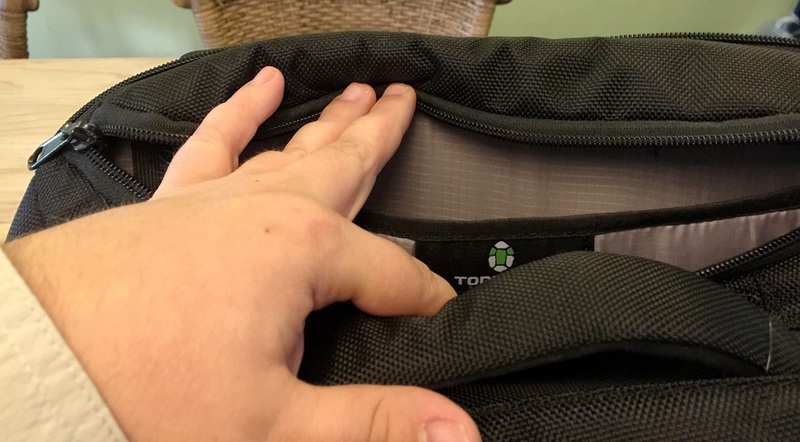 There is an extra zip on top of the bag that only allows access to the laptop so I can very quickly pull it out without opening the whole backpack and rooting around. This is so incredibly handy, particularly when we fly as a family and wrangling a 3 year old and stroller. The security checkpoints are a pain but easy access eases the pain greatly. As to the sleeve itself, I find it to be well padded and secure. I don’t worry about having my laptop in it. While I do have it in an external sleeve most of the time, I don’t worry if I just put my laptop in the backpack naked due to the padding. 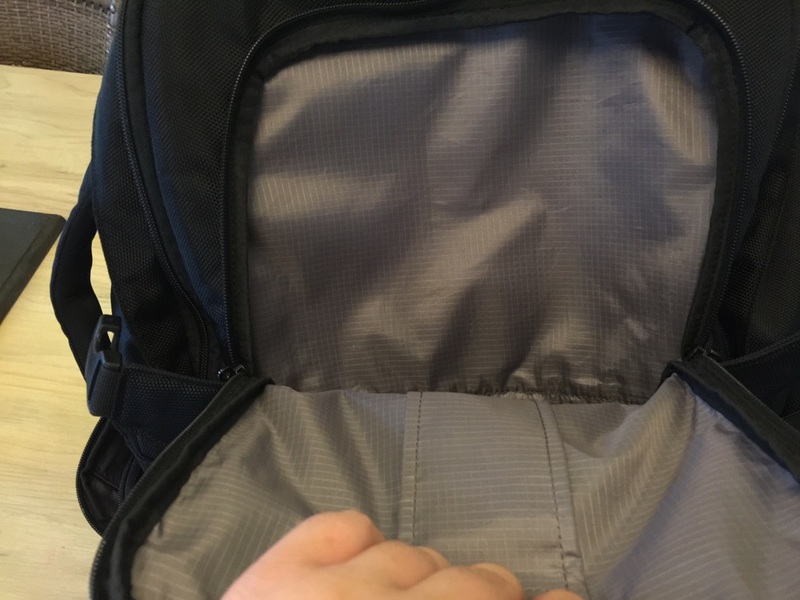 Most backpacks are top loading: unzip it around the edge and pull it apart a bit and try and jam as much as you can in. It makes for disorganized packing (particularly with things like clothing) because there are many hard-to-reach recesses. Not so with the Tortuga. It’s fully front loading: it fully opens and allows easy access to pack like any full-sized suitcase. I can easily pack clothes either folded or rolled and can easily stuff socks and underwear in the typically hard to reach spots (I probably pack wrong but it works for me). I don’t feel like I’m wasting in space and I’m pretty sure I’m able to get more in because of the easy access. 44 Liters is big for a backpack. My old backpack was around 22 liters (so half the size). I’m amazed at what I can get in here. If you know me you know I’m a big guy but I can still fit the things I need for 4 to 5 days away (assuming no laundry done) without any issues. While this might mean a boring wardrobe, this doesn’t bother me. My wife didn’t think I could actually use it for “carry on only” travel but was pleasantly surprised by the size as well. While I’d probably say it could use a bit more (see downsides below), I’m quite happy with the internal organization areas that exist on this pack. In the main compartment there is a laptop sleeve. The outer “slice” has mesh pockets that are great for stashing electronic bits. The compartment itself has some divider pockets (I’m not sure what else to call them) that are nice as well. I typically stash my projector (I need to review this here sometime as well) or external hard drive there if I’m going on training trips. All of these pockets seem well bit. They aren’t well padded though (except for the laptop sleeve) but typically this isn’t an issue, particularly if the bag is full of clothes - they provide sufficient padding. I didn’t quite know how I’d feel about the hip belt. My big 90l hiking backpack (which I’m selling if you are interested) has them but I never used them (to be frank, I never cared that much for that bag as it wasn’t practical for every day travel and I don’t do much traditional hiking). I find myself using the belt on the Tortuga though and it really does help stabilize the bag, particularly if its full. Running through an airport trying to catch a tight connecting flight is just a bit less stressful with a bag fit securely in place. I also find the hip belt pockets quite nice (but I often forget to use them). This is definitely one of those features I didn’t know I’d love pre-purchase. I also like that it has secure, well padded handles for those moments you need to use it without throwing it on your back. It’s got one on the top of the bag and one on the side; depending on the situation both work well. 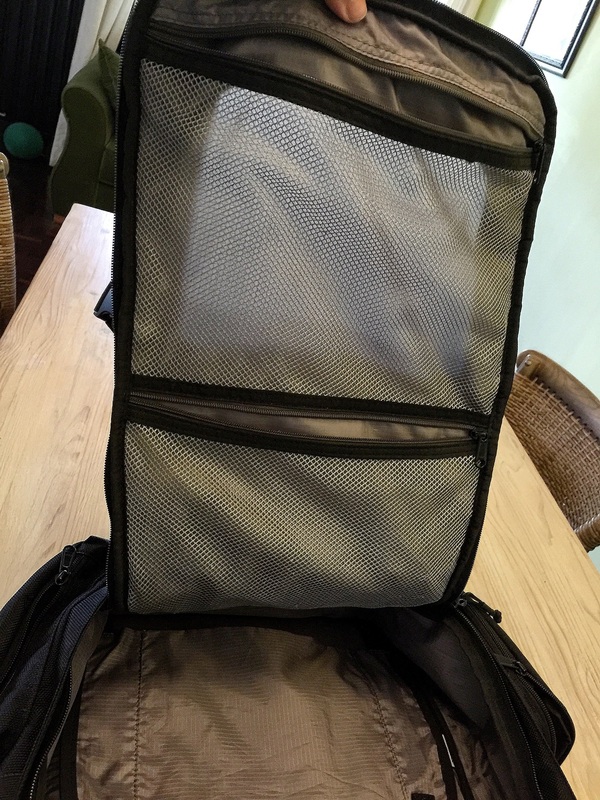 I use the one on the side for carrying it like a duffle and the one on the top for quickly loading it into places (overhead bins, car trunks, etc). It really only is a travel bag. I don’t use it to go work at the office or coffee shop. It’s too big for that; I’d be awkward to use as an everyday carry. For the price I kind of wish it included a bit more organizational structure. Perhaps something like a simple insert to make divided pockets. Again its not a big thing but it would be helpful. I’ve considered getting the packing cubes as it would fill that need (but haven’t honestly wanted to spend the extra $50 for them). Going along with this point, the front pocket would benefit from some love and attention. It’s just kind of bland as is. I’m not thinking of much - pen loops would be helpful and maybe a small pocket to contain business cards or something similar. As it is things just kind of get lost in it which makes it less functional than it could be. I couldn’t be happier with this carryon/backpack. It fulfills the needs I have better than any bag I tried. The material and build quality stands up to the test of a years usage (it still looks pretty much brand new to me). From a financial standpoint it costs $199 (which definitely isn’t cheap). But you can see this in the quality of the material (again it looks brand new after a years usage). And I know that I’ll repeatedly make back the cost of the bag in saved checked luggage fees (when looking at round trip tickets 1 checked bag runs $50/leg so 2 trips costs the same as the bag; I’ve got more than that scheduled in the coming year) since most airlines where we are charge for checked luggage. Finally , as so much of what is out there was designed for wilderness style hiking and camping not trekking and traveling in more urban environments it was a blessing to find this pack. While I’d say my travel bridges the gap between hiking and urban trekking, I lean much more in the direction of urban treks and most of my journeys have urban aspects that make traditional backpacking equipment unwieldily. I’m hoping this pack will last the next decade or longer (and I definitely think it could). Is this the bag for you? I’d say if you travel a lot and dislike checking baggage it most definitely is. Particularly as more and more airlines move to greater checked baggage fees you’ll benefit from having a carry on you can jam everything into. If you are a more traditional hiker/backpacker avoiding the city lights whenever you can you’ll probably find traditional framed packs more suitable to your needs (they fit tents and similar equipment the Tortuga wasn’t designed to handle). 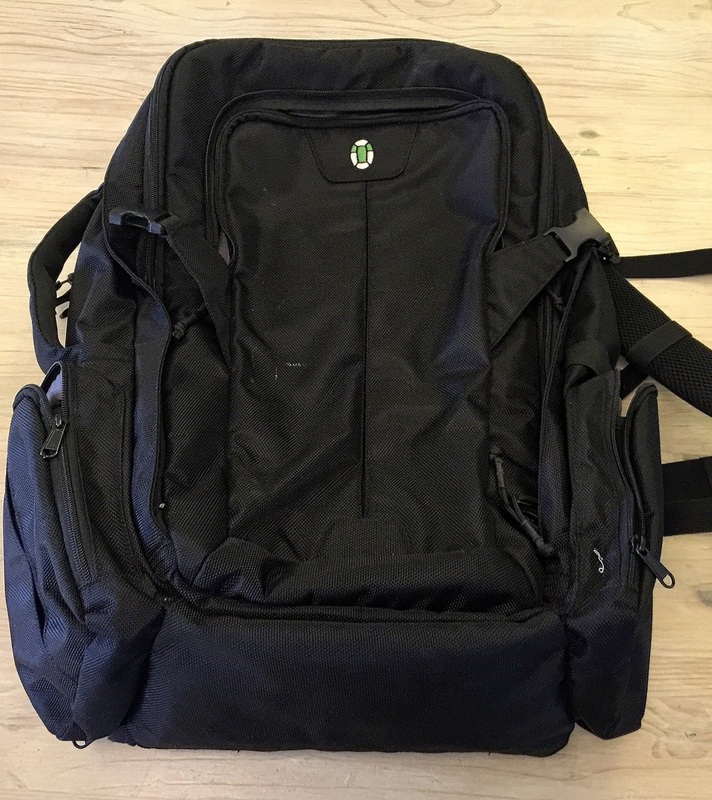 Also, if you are looking for more of an every day bag, this beast of a backpack probably isn’t it; it’s just too big to serve that purpose well. They make a Daypack and a smaller backpack called the Air that might suit that need. The Daypack is 20L and the Air is 27L compared with the 44L Travel Backpack.